Wedding photos on the Beach at the House of Refuge. 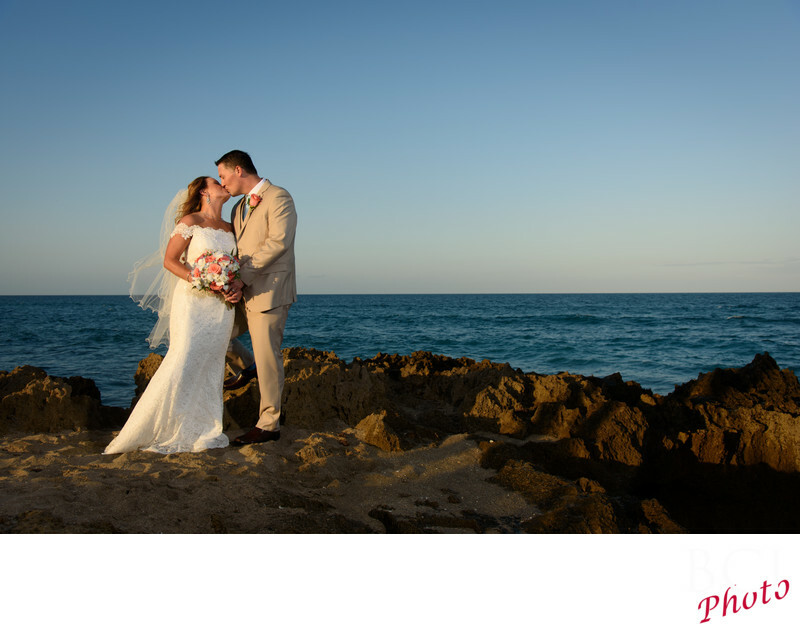 This incredibly romantic beach wedding portrait showcases all that is terrific about The House of Refuge in Stuart Florida. this great oceanfront venue boasts some of the most unique and awe inspiring beaches in the area. From the striking rock formations, to the iconic watch tower and museum, the House of Refuge is always a favorite wedding venue for us to work at. Often people forget about the other side. That is, just across the street, is the indian river, and hopefully a beautiful sunset opportunity over the river and the cool dock thats on that side. This is also an example of our subtle lighting techniques which result in very natural looking images. The fading sunlight here, while striking created deep shadows on the right side. These we eliminates by using our dynamic off camera lighting from the shadow side to deftly bring the exposures up just enough to make the image, look like the scene appeared to the naked eye. If you'd like images like this for your wedding, give us a call today. Our available dates are quite limited. Engagement session photography is also a hot agenda at the house of refuge as well.